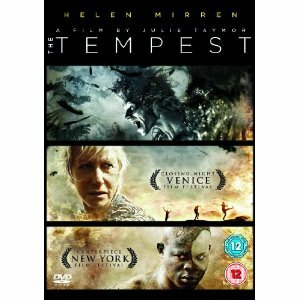 Julie Taymor’s film of The Tempest sank from view rather quickly on its original release, despite having the eye-catching coup of Helen Mirren taking on the lead role – renamed here Prospera. It wasn’t the best of times for Taymor at the beginning of 2011, riding a rather torrid time over the debacle of the much-delayed Spiderman musical, and perhaps people didn’t take this work as seriously as they might have done otherwise. Her previous Shakespeare adaptation – the fierce Titus – was a film I found endlessly intriguing and so I was actually quite keen to see this and thus frustrated when I realised I would have to wait for the DVD to be released. Was it worth the wait…well, I’m not sure it was to be honest. The casting of Mirren is inspired and the text carries the little tinkering it needs to accommodate the gender switch very well – she’s the Duchess of Milan whose husband is murdered and title usurped by brother Antonio – and there’s an interesting shift in emphasis of the parenting relationship, the testing of Ferdinand feels more rooted in ensuring he’s an ideal suitor for Felicity Jones’ willowy Miranda. And Mirren speaks the verse with an intense passion, a burning fervour of injustice never far away but underscored with a measure of warmth. It’s the rest of the film that disappointed me. From the clunky visual effects that look horrible, especially with Ben Whishaw’s sprite Ariel seemingly rarely there in person but constantly an image manipulated by CGI (though apparently a necessity as scheduling conflicts meant he couldn’t film for long) and accompanied by pained rock music to the lack of screen charisma from Felicity Jones and Reeve Carney as the young lovers (assumedly cast for his singing ability more than anything) to the plodding laboured ‘comedy’ of Russell Brand and Alfred Molina. It all just feels quite tired and uninspired. Part of the problem is that I’ve seen what will probably be the definitive production of The Tempest for me in Cheek By Jowl’s Russian take on the tale and all others seem destined to pale by comparison. But I also do feel that something in Taymor’s vision hasn’t quite accompanied the capturing of it on film. There’s a really entertaining documentary on the DVD which I have to say I found more engaging than the film itself: the director, actors and other creatives all talking at length about their experiences and processes, even the practicalities of filming on Hawaiian beaches, and I was left wondering what could have been. There are strong touches in the soundtrack though, Twelfth Night’s O Mistress Mine is borrowed well and Beth Gibbons’ provides haunting vocal support for the finale, Sandy Powell’s costumes are fascinating and above all, Mirren’s performance does make this worth a rent, if not necessarily a purchase.